Enchanted Excurse: Give It A Chance! Evening Loverlies! 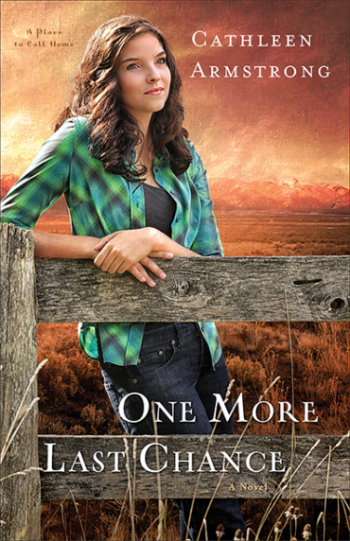 I have finished reading One More Last Chance by Cathleen Armstrong. First thing I will share with y'all is the synopsis found on Goodreads. Sarah Cooley has come home to Last Chance, New Mexico, for one reason–because it doesn't change. After an engagement gone bad with a man who wanted to change everything about her, Sarah is more than ready for the town whose motto may as well be, “If it ain’t broke, don’t fix it.” Chris Reed, on the other hand, wants nothing more than to spark some change in the little town. As the new owner of the Dip ‘n’ Dine, he’s shaking things up to draw folks from all over the Southwest into his restaurant. As it turns out, the winds of change are blowing into Last Chance–just not in the ways that Sarah or Chris might expect. With the same evocative writing and fascinating characters that won fans for her debut novel, Cathleen Armstrong invites readers back to Last Chance for a soul-searching, romantic story of two people navigating the twists and turns of small-town life. This book is the second book of the A Place To Call Home novels, but they are easily read without reading the other books I have noticed. This book just seems like a perfect movie for Hallmark, I am hoping there is a movie of it already. If there isn't a movie made of it, there should be. It was a very sweet story about overcoming some life struggles that can be hard. As I read more into it I got really anxious just to see what will happen, and this author did not disappoint with what happens. lol Reading this book makes me want to live in the country, even though I'm sure once I was there, I probably would go bonkers. I like being able to look around at stores whenever I can, but it does make me miss the country. The people in this town Last Chance seemed to always want to help one another. It makes me hope that I can be as kind and giving as they are. Sometimes with my anxiety it will make ya wanna just be a hermit, when really deep down ya just want a friend there. I loved Elizabeth, sarah's grandmother, she was very kind and you knew she was a God fearing woman. I would love to be a grandmother like that when I get older. :) Again this was a very sweet and great story to read. Reading this book will not be a waste of your time, so give it a chance.